Give your guests something elegant to commemorate your wedding anniversary celebration by the beach. 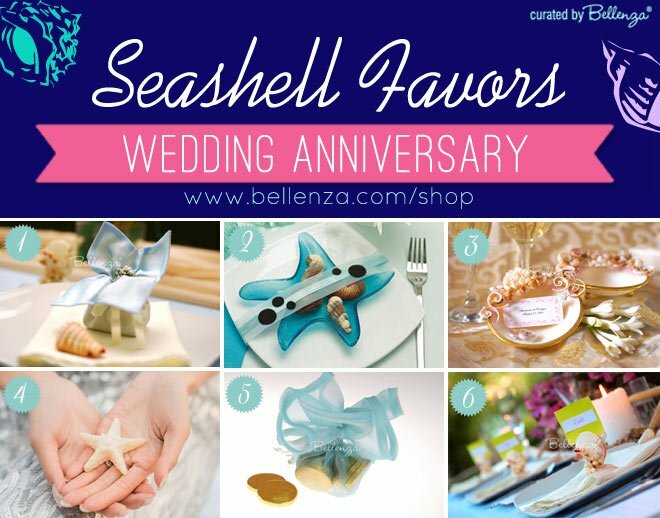 With these 6 practical and pretty favor ideas inspired by seashells and starfish, we’re sure you will find what you need today! From seashell dishes to place card holders, use these keepsakes to decorate your tablescapes, while serving as lovely keepsakes. Give a lovely sachet bag (1) filled with saltwater taffy, that can be used a nifty card holder on your tablescapes. You can also present guests with chocolates in the shape of shells and starfish in a pretty blue-hued glass dish (2) . Mini candles (4) are a practical favor, which you can present in shell soap dishes (3). For a treasure-hunt theme anniversary, consider giving gold chocolate coins in aqua wrapping (5). Lastly, get double duty favors that show guests their seats with these authentic shell card/photo holders (6). Now, wasn’t that easy!